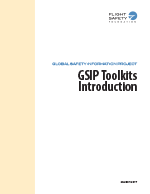 The Global Safety Information Project (GSIP) toolkits are intended to help the global aviation community elevate its safety risk management capabilities and information sharing practices. To develop these toolkits, Flight Safety Foundation worked with a broad range of stakeholders from air navigation service providers (ANSPs), airline/aircraft operators, airports, manufacturers, maintenance organizations and regulators. Over a three-year period, the Foundation engaged with industry through several workshops, focus group sessions and conferences in over 15 countries. The Foundation also extended its global reach through a four-part webinar series and through the administration of multiple industry surveys. 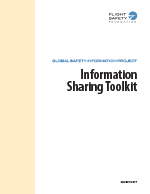 These intensive research and collaboration efforts resulted in the development of three safety data collection and processing system (SDCPS)-focused toolkits. Each toolkit contains data-driven recommendations and best practices identified by industry for the development and maturation of various safety data collection systems, data analysis methods, information sharing practices and safety information protections. 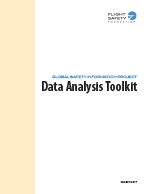 The toolkits are designed for use by a wide range of aviation domains including ANSPs, airline/aircraft operators, airports, manufacturers, maintenance organizations and regulators. 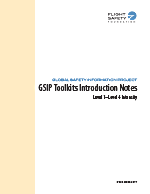 The GSIP toolkits are organized by intensity level, a term developed by the Foundation to describe the relative sophistication of SDCPS practices. The Level 1 Intensity Toolkit contains safety data collection, analysis, and sharing methods typically associated with a foundational safety management system. 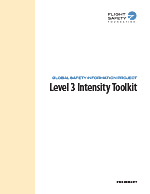 The Level 2 and Level 3 Intensity Toolkits each contain progressively more advanced insights and practices. Flight Safety Foundation welcomes and encourages your feedback. Please submit your comments, questions and suggestions to Mark Millam, vice president, technical.